Our first BCM bake of 2019 and it’s a good one! 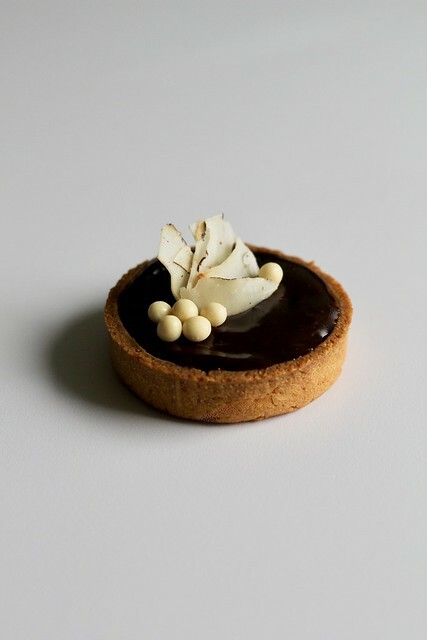 This Chocolate-Coconut Tart has one of my very favorite flavor combos, with coconut pastry cream hiding under a shiny dark chocolate ganache, all inside a sweet tart crust. I’m glad that cutting back on sweets was not one of my new year’s resolutions, or I guess we are saying “intentions” now, because I do intend to enjoy every bite of these babies. I did decide to responsibly keep myself from going overboard by scaling back the recipe to make a few small tartlets instead of a large format tart. This recipe has a few components, but I spaced them out over a couple of days to make things manageable. I actually had some of Dorie’s Sweet Tart Dough in the freezer and I used that to line my shells. I made the pastry cream (I used all toasted coconut and coconut sugar to boost that flavor) and I stashed it in the fridge, along with my lined tart shells, overnight. The next day, I baked and filled the shells, then made the ganache and topped them off. Easy peasy to make and to eat. It tastes like a fancy Mounds bar. Why did it take us so long to make this? Thanksgiving was a bit of a whirlwind, in between getting ready for a very busy dinner service at my restaurant job and pulling off my own dinner at home. I knew I had to find a place on my menu for this week’s TWD recipe if I wanted to get that done, too. Luckily, a Brown Sugar Tart sounded like a pretty appropriate Thanksgiving dessert. My father, who finds pumpkin pie to be the only acceptable sweet on turkey day, would disagree, but he wasn’t visiting this year. Time to break with tradition! 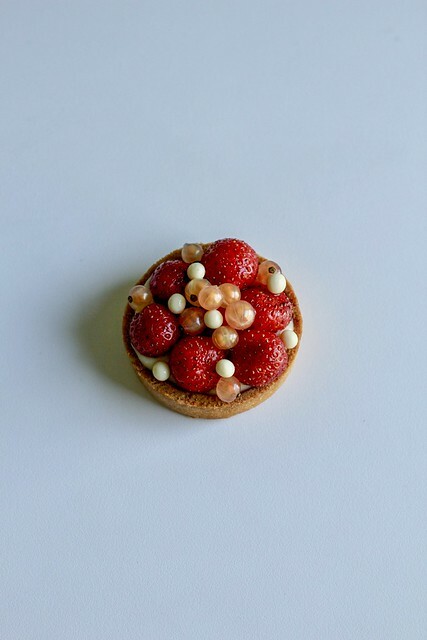 I did pay attention to the reviews from the folks who made this tart on the first posting of the month. “Too sweet” was pretty much unanimous, so I tried to find little ways to adjust that a bit. The tart filling is just simple custard of heavy cream, eggs, sea salt and light brown sugar, with some optional espresso powder and bits of smokey bacon. I used a combo of light and dark brown sugar for extra flavor and added a little more salt and espresso powder than the recipe called for, until I thought it tasted just right. The bacon was skipped altogether. 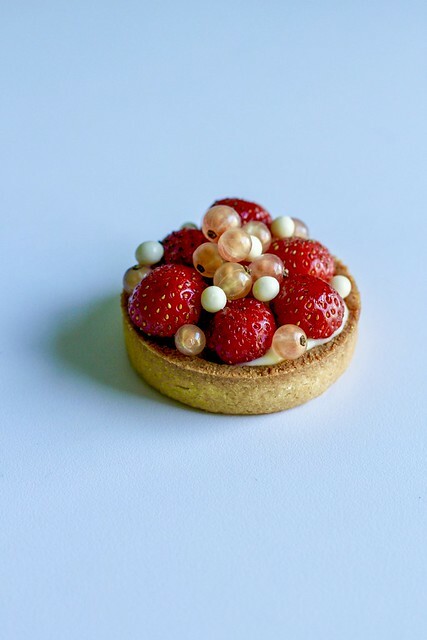 I thought this would probably be best served in small portions, and made little individual tartlets instead of a larger one. Once upon a time, we made an espresso-caramel syrup called couleur for a Baking with Julia cake. This is something that I like to keep a bottle or jar of on hand now because it’s really bitter-sweet intense and tasty, and it lasts forever. 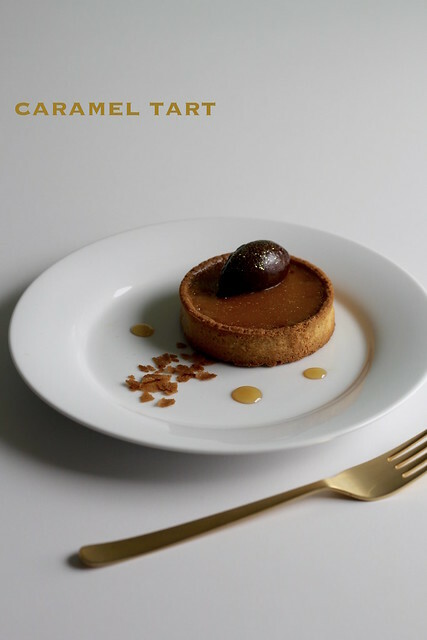 I thought it might be just the thing to temper the sweetness of the tart filling a bit, especially since Dorie recommends adding instant espresso to the filling anyway (and also serving the finished tart with coffee ice cream). I used that couleur syrup to glaze my finished tartlets and served them with some unsweetened cream and maple toasted pecans and sunflower seeds. I have to say, and I know that I have a huge sweet tooth, I really liked this recipe. I followed some good advice from Diane and served it well-chilled. I even broke out the fancy silver! 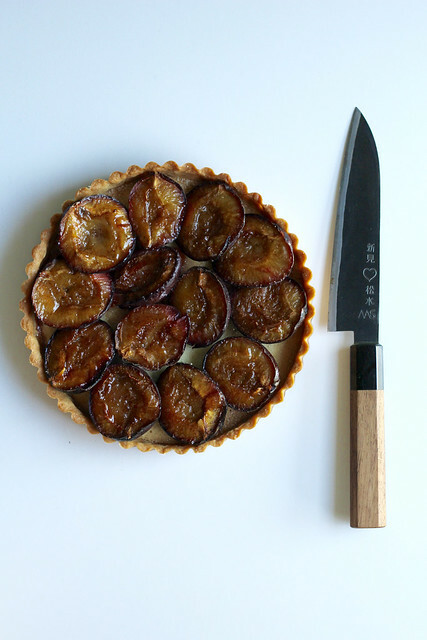 The Simplest Plum Tart was a recipe that I wanted to try but was skeptical of at the same time. It’s really just a sweet tart shell and plums. Ok, there are also some cake or cookie crumbs to soak up juice and some cinnamon sugar to add sweetness and bring out a bit of said juice. But there’s no real binder here and the plums are no more than halved and pitted (well, washed, too, of course). I thought it might be a little blah, but if you love plums, there is something quite satisfying about biting into a fat, juicy baked plum half. 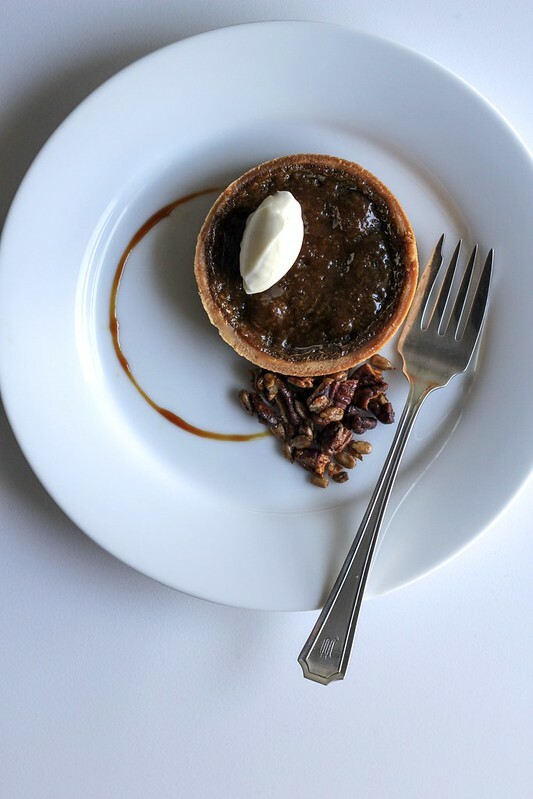 Dorie suggests serving this with crème anglaise, and maybe after throwing together the simplest tart ever, I should put in at least a little effort to make some custard, but I thought store-bought vanilla ice cream was just as good. Let’s not start to complicate things. 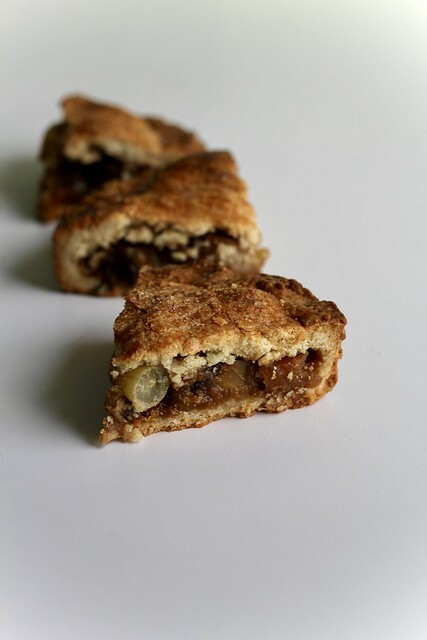 I think this would look so pretty baked in a long rectangular tart pan…I do have one, but like most of my good ideas, I didn’t think of it until after the fact. If I make it again, I’ll use that. I’ll also smear the crust with some almond frangipane. I almost always have some in the freezer, so really it’s just as simple as cake or cookie crumbs. I look forward to a good rhubarb dessert every spring (now summer! 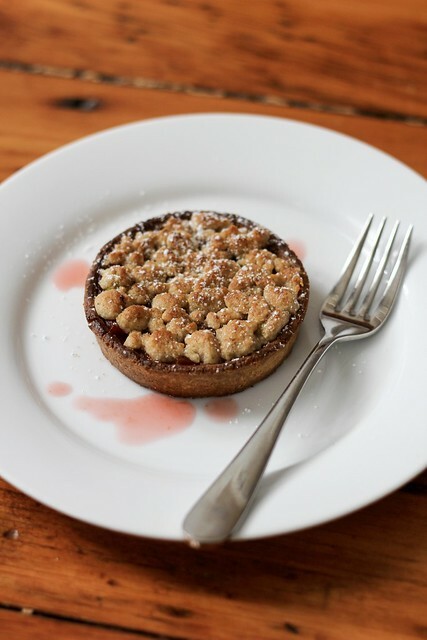 ), and this Streusel-Topped Rhubarb Lime Tart fit the bill nicely. Dorie’s sweet tart dough and crisp streusel encase a a kinda tart filling of rhubarb, lime and custard. It all balances out nicely…soft, tart insides and crisp, sweet outsides. 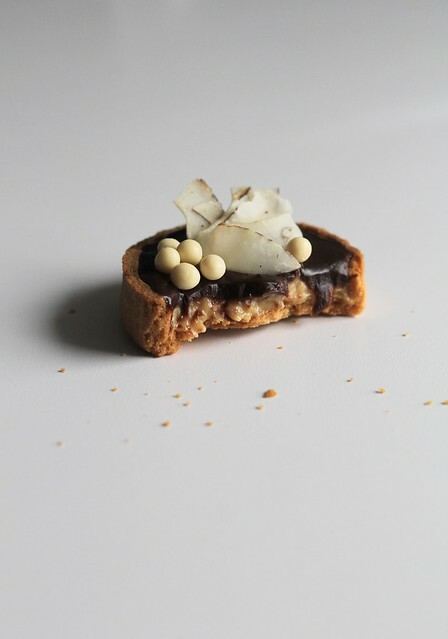 I made little individual tartlets and guessed the baking time would probably be less than for a full-sizer. I decided to use some roasted rhubarb compote instead of raw chopped rhubarb in my filling, just in case it wouldn’t have time to cook down fully. That was the only change I made. It was delicious, and I see more of these in my future. 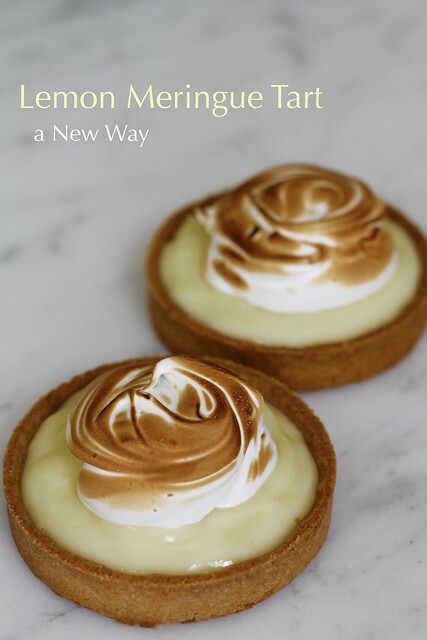 A Lemon Meringue Tart is a great classic spring dessert, and you get to burn stuff on purpose– time to break out the blow torch! This one has a little twist though. The “new way” here refers to the lemon filling, which instead of a snappy, eggy curd, is a lemon pastry cream. The result is lighter, in terms of texture and tang. I took it a new way of my own and used some Meyer lemon zest and juice I had in the freezer in place of the regular stuff. The Meyer lemons probably made the filling a little more tame in terms of tartness as well, but it was definitely delicious. Also, I made tartlets instead of a big tart, because I don’t like to share. Just kidding. Not really. For the recipe, see Baking Chez Moi by Dorie Greenspan. Don’t forget to check out the rest of the TWD Blogroll. I do like a good baked pear dessert. Apples and pumpkins will be around for a long while yet, but pears are more delicate and have a quicker season. Use ’em while you can! This Pear Tart with Crunchy Almond Topping has Dorie’s Sweet Tart Dough holding a mound of lightly caramelized pears and a topping of sweet and crispy glazed sliced almonds. Pear-plus-almond is a classic combo, and for good reason– it’s delicious! I did one thing to my tart that wasn’t in the recipe. I had a little bit of almond frangipane in the freezer that I’d been looking for a home for. After blind baking the tart shell, I spread it on in a thin later before piling on the pears and the almond topping. Not a bad call, if I do say so myself. 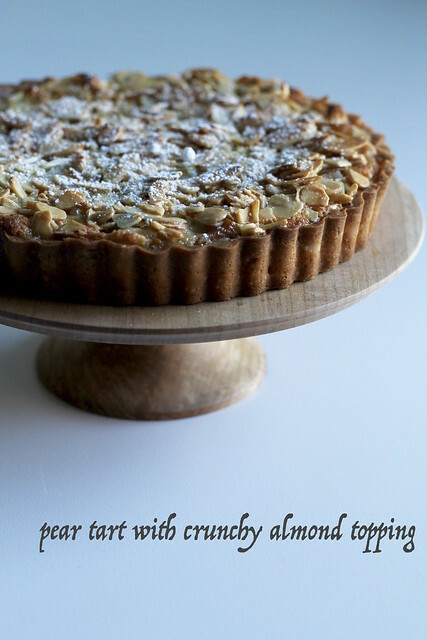 This tart is really best the day it’s made. The topping and the tart shell both go a little soggy after sitting overnight…although that sure didn’t stop us from finishing it! I guess it’s about to be fall here, although the outside temperature isn’t quite on board with that yet. 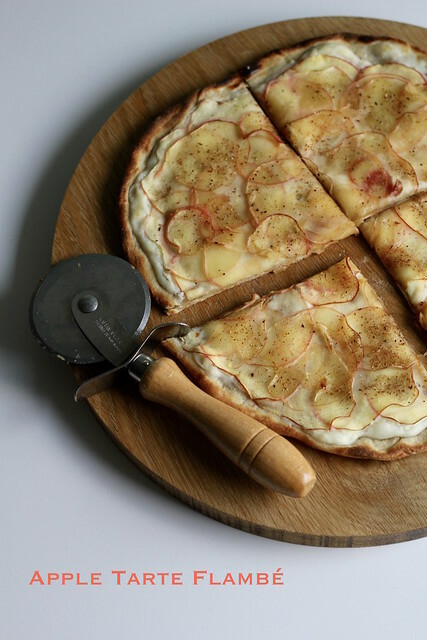 Maybe I’ll hurry things along by baking up an apple dessert, like this Apple Tarte Flambé. Everyone says that tarte flambé can be thought of as Alsatian pizza, so I’ll repeat it. 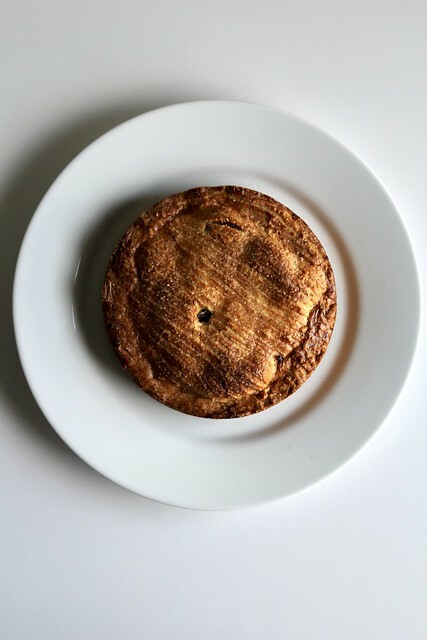 Usually it’s savory, with onions and bacon (like the Alsatian Onion Tart we made a while back), so this one’s a twist, with a sweet creamy topping and see-through slices of mandolined apple on top of a thin yeasted base. It’s key to roll the dough on this really thin. It shouldn’t really have much of an outer crust at all. Pricking the dough all over the place also helps keeps it from poofing up in the oven. I used a red apple, and would do so again, if only because the paper-thin slices bake up with such pretty frilly pink edges. Once this tarte is out of the oven, it’s time to slice and eat it straight away, when it’s crispiest and most delicious.